Unless you happen to have automatic four-wheel drive, you will need to know when to use your vehicle's four-high and four-low settings. Here's a quick guide that should be helpful. The four-high setting is reserved for roads that are slick with ice or rain but are otherwise level and smooth. It will give you enough traction to drive at close to normal highway speeds. 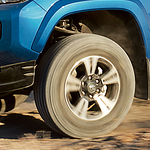 The four-low setting is meant for rough terrain such as deep snow, sand, mud, steep inclines, and terrain that you might find while driving off-road. You won't be able to go faster than about 40 miles per hour, but you would be able to get out of situations that would be impossible to navigate without four-wheel drive. It's important to remember that four-wheel drive should only be used when you need it as using it in ideal driving conditions will damage your drivetrain. If you would like to learn more about four-wheel drive or to find a vehicle that has it equipped, contact Route 15 Used Car Center. We will be glad to answer your questions.